Running water has a calming effect, doesn’t it? I’m not quite sure why we find that sound to be tranquil and relaxing, but I’m pretty sure that practically the entire world population feels the soothing effects. 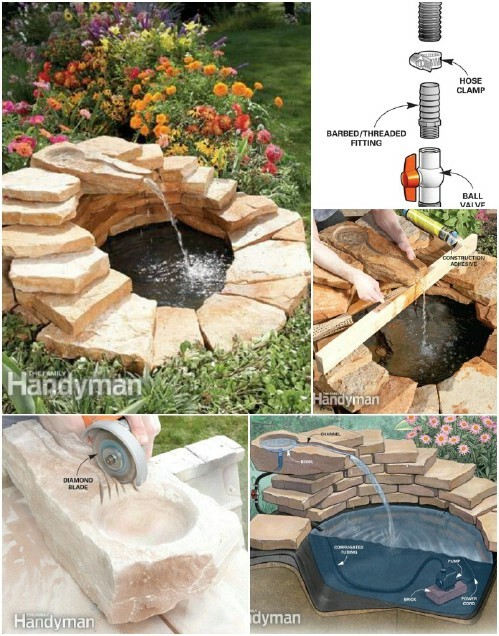 Whether you opt for buying an affordable premade fountain or decide to build your own, you’re bound to get some great inspiration from these gorgeous features that highlight nature’s most important element. This outdoor water wall is without a doubt one of the most striking and visually stunning garden projects I have ever laid eyes on. And the fact that you can make it with your own two hands just makes it so much more attractive, in my opinion. This will cost you around $250 to $300 which peanuts compared to the price if you were to buy it already made. If you have one of those round glass-top tables that you’re not sure what to do with, you should really consider using that glass piece to create this beautiful water wall – of course, a square shape would work, too. Repurposing materials will make this an affordable build. 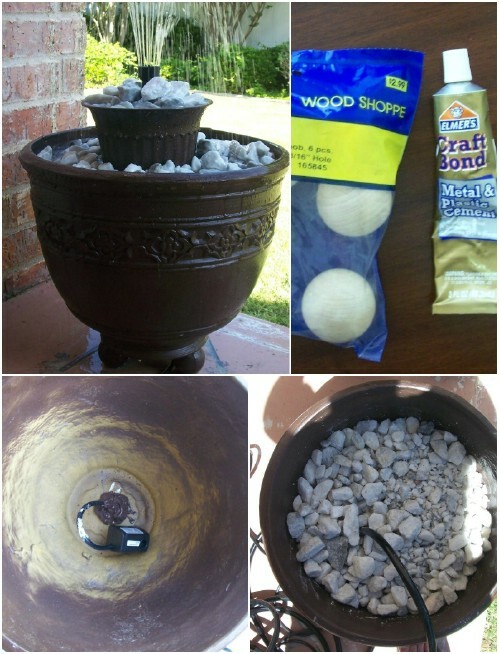 This fun project is a nice quick and easy one since you don’t really need all that many materials and tools. 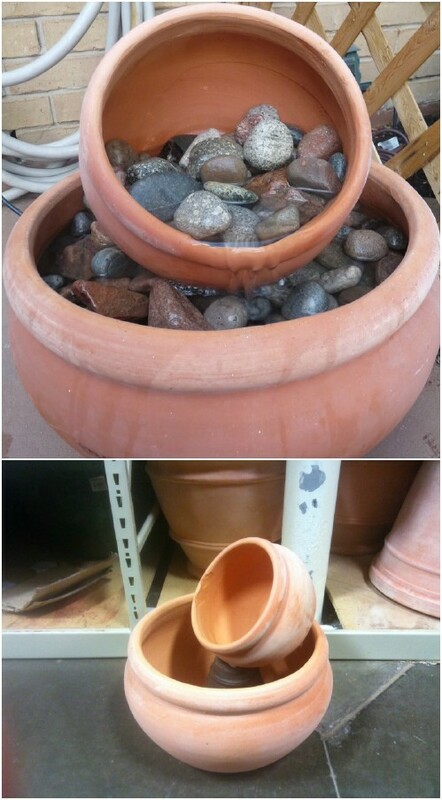 Take the time to trawl the gardening stores to find the perfect pots. And if you don’t have too much space and want to downsize, you can always use just two pots instead of three (alternatively, you can add another pot if you want it even bigger). 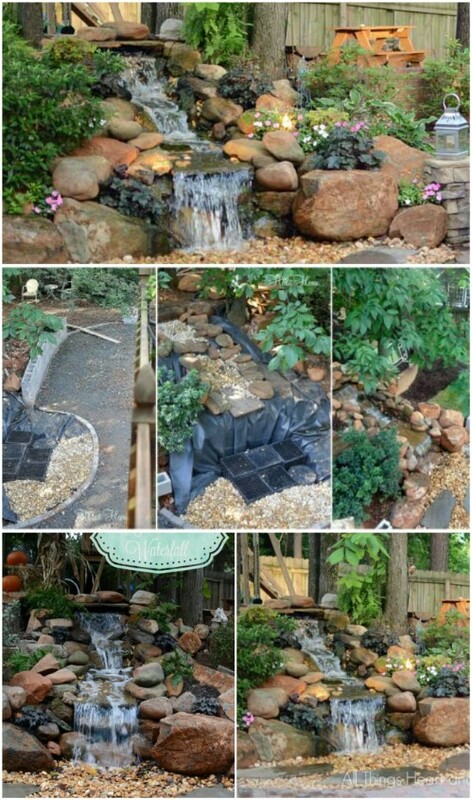 If you want to save thousands on a lovely pond water feature, you can make something like this yourself for just a few hundred dollars. The original DIYer and tutorial writer got all her supplies from Lowe’s, so getting everything together won’t be much of a struggle. 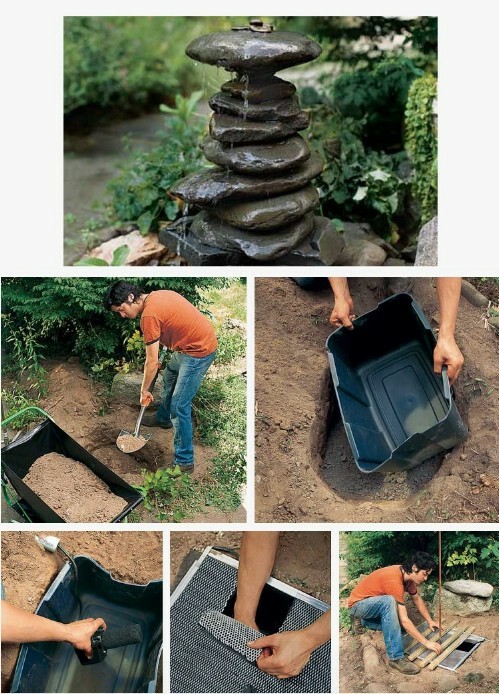 Don’t forget to make it your own in terms of your stone placement and plants. This particular artesian fountain will only take about two days to make and isn’t actually too big of a project, so don’t feel intimated by this one. This design makes use of a gravel-filled reservoir as opposed to a collection pond, the maintenance on the whole thing will be rather low. 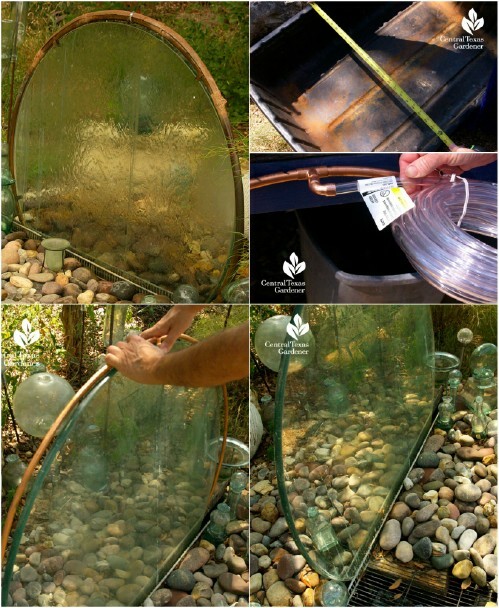 If you don’t have the space, money or time to build a pond but still desperately want a similar water feature, then this mini pond in a container is something you should strongly consider. 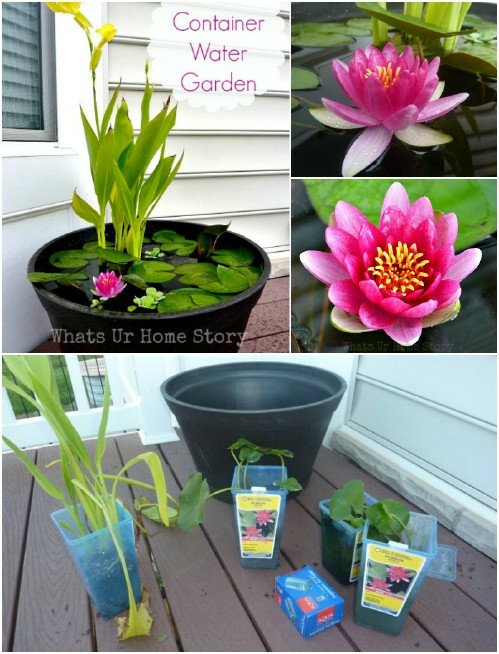 The water lilies and lettuce look so pretty and calming in there, and thanks to its smaller size, this is the perfect way to beautify your porch. 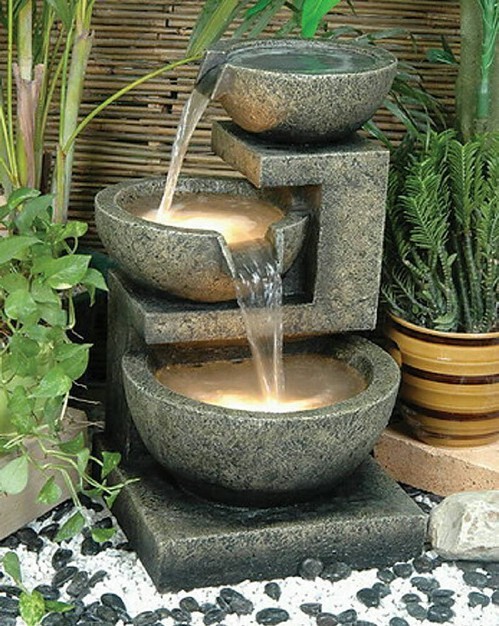 You don’t always have to make absolutely everything with your bare hands, you can buy yourself something really beautiful like this fountain that can be kept indoors. 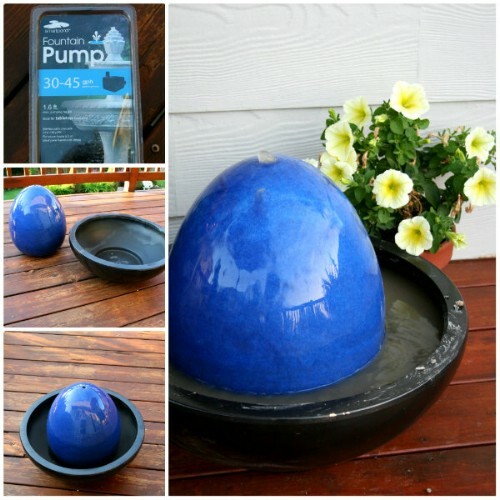 It’s a solid product that’s really easy to set up, built to last, and emits a very soft and soothing sound of flowing water that isn’t disrupted by the sound of the pump. 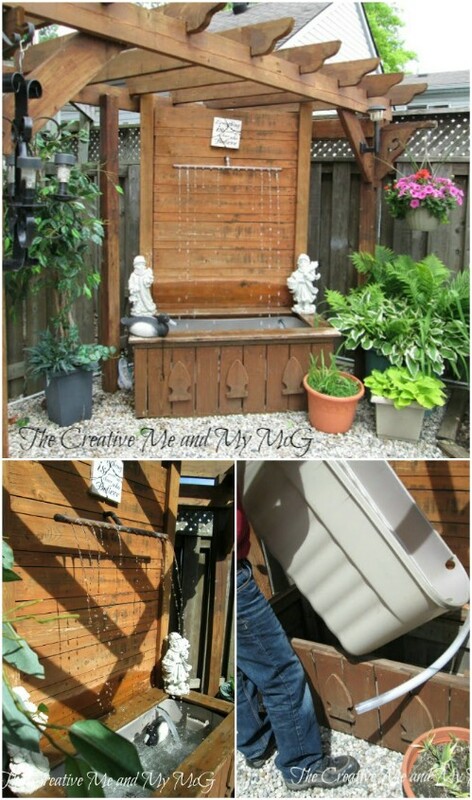 I just love all these flower pot fountain ideas because it really is the simplest way to make your own water feature with minimal effort, and it makes such an impact! This tutorial really shows you just how easy it is to set up yourself. Look at what a difference it makes if you just lean the smaller pot ever so slightly! It totally changes the look. 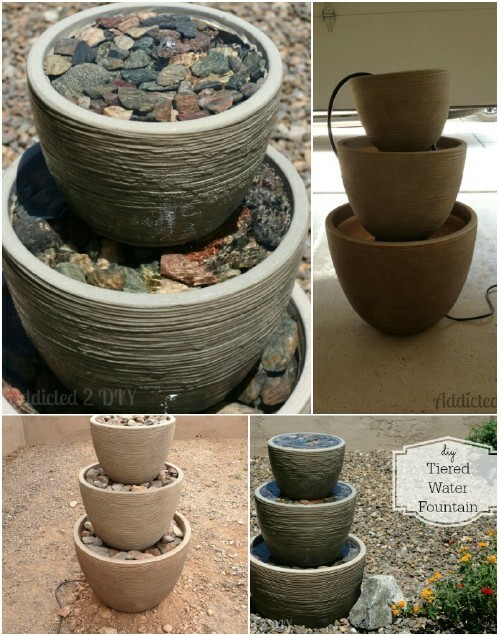 I love the fact that you can fill the pots with rocks that are very visible – it just adds to the beautiful visual impact. 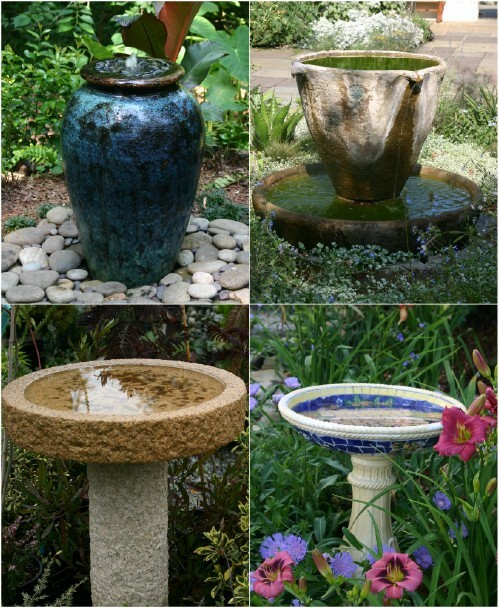 If you really like terra cotta as a material, then you’ll go crazy over our collection of outdoor terra cotta crafts. 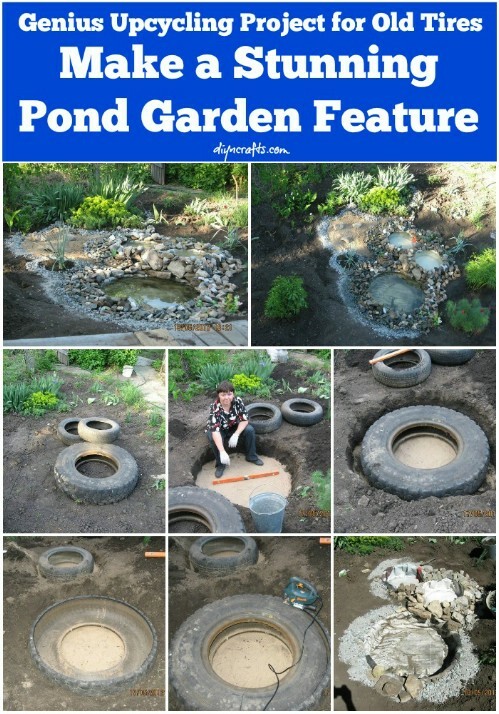 A couple of old tires can be repurposed to make a lovely little series of ponds in your yard. It’s a very simple build, and once you have the basic setup, you can put your own personal spin on it in terms of the decorative stones, plants and gravel. Isn’t this just awesome?! I love the playfulness of the idea of filling a canoe with water instead placing it in water. It has a small submersible filter and is even home to some happy little goldfish. 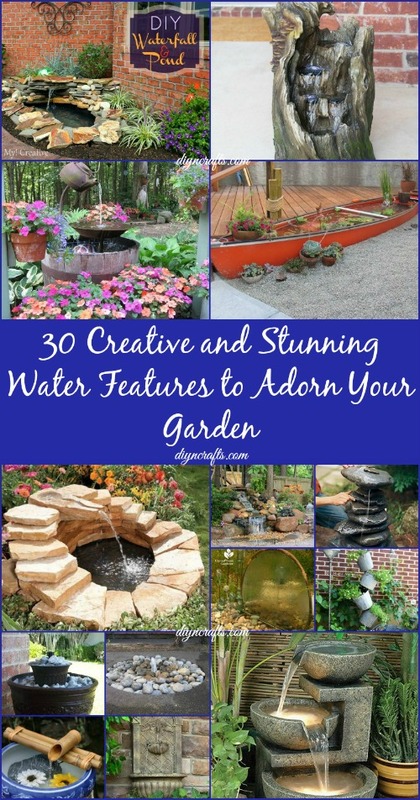 You won’t have to line since canoes are built to be waterproof in the first place, and you can have some real fun with the plants and decorating. 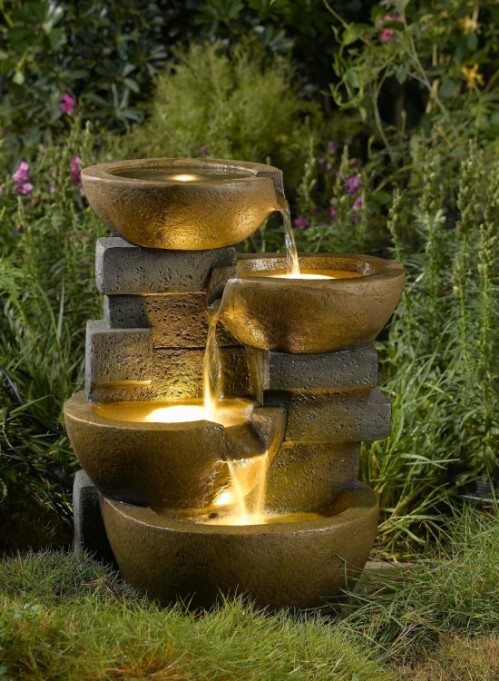 This stacked stone water feature really appeals to me because of the simplistic design and natural elements. It’s almost shocking to think (and see!) that merely stacking some stones on top of each other can make such an impact. You would never guess that this isn’t actually a real log – it’s actually made from weather-resistant fiberglass and resin so you’ll get to enjoy it for a good number of years. I absolutely love the inclusion of the LED lights because it just makes it look so much more special. And it’s really easy to install so there’s nothing holding you back! 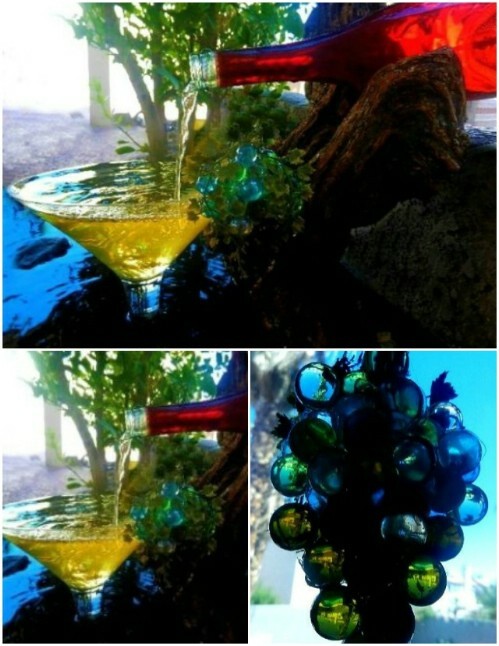 This is such a creative and fun way to reuse an old wine bottle – and I have many of those lying around! If you have a big collection of empties you can even make yourself a chandelier. Let your personality shine through with your own selection of decorations. I’m so glad that someone decided to make this with copper because it’s one of my favorite materials! As the water continues to trickle down the wall, it’ll change the color of the copper sheet and leave some markings, which, I believe, will add some fantastic character to the piece. I just love the idea of natural elements changing this over time. 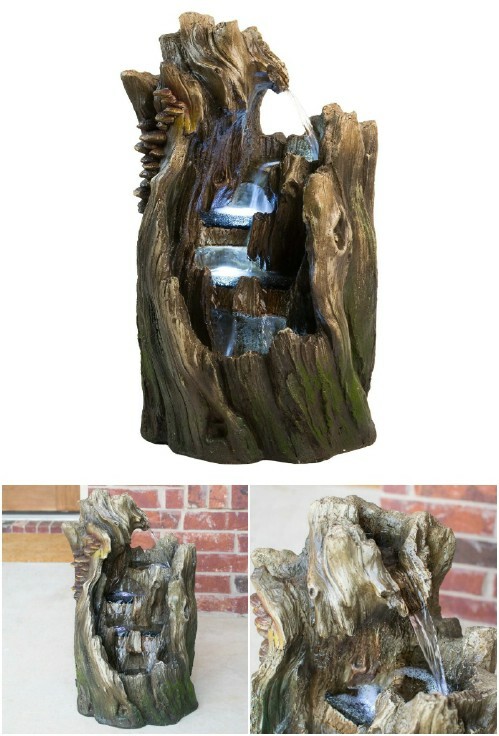 If you really love that sound of water flowing over rocks and have a lot of space to work with, then this waterfall really is the ultimate DIY water feature. This project is fairly labor intensive, but just look at that showstopper! It’ll definitely we worth all your hard work. This beautiful feature is made from polyresin and fiberglass, so although you can keep it indoors, it’ll be safe for outdoor use, too. I just love the LED lights that add to the sensory experience! 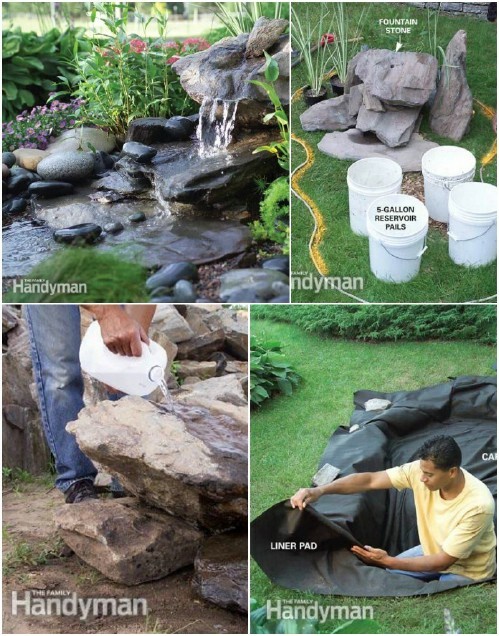 This product has a very simple setup, so once delivered, you’ll have it up and flowing in no time. This isn’t just a water fountain, it’s a piece of modern art! This gorgeous sculpture can really add to any outdoor space. 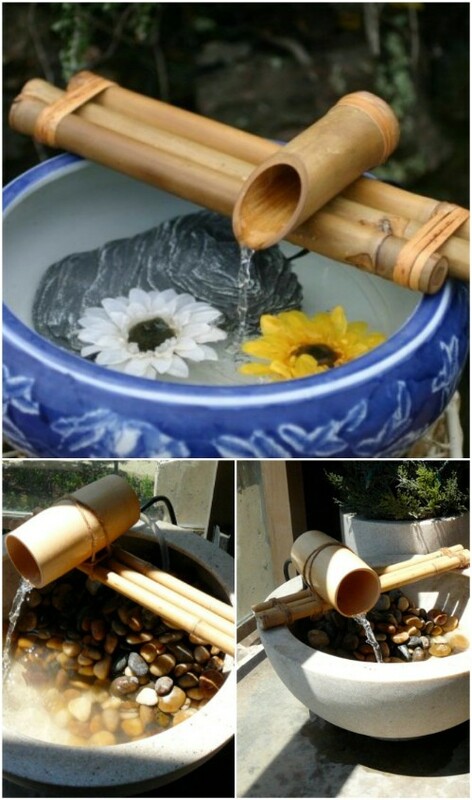 Although the materials used are of good quality, this realistic-looking fountain should be sheltered from bad weather conditions during the cold winter. 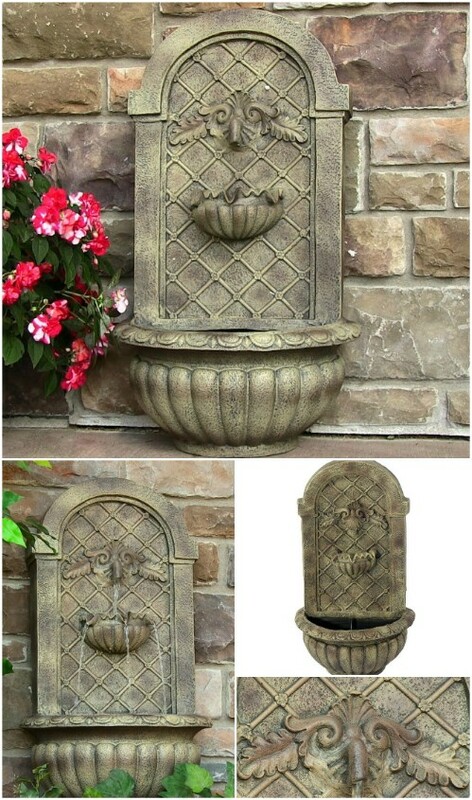 This Venetian wall fountain looks like it’s made from heavy stone, but it’s actually made from lightweight yet durable fiberglass. It can be mounted on any wall, so getting it set up will hardly take up any time or effort. Sometimes it’s nice to treat yourself and buy something really pretty instead of going the DIY route. 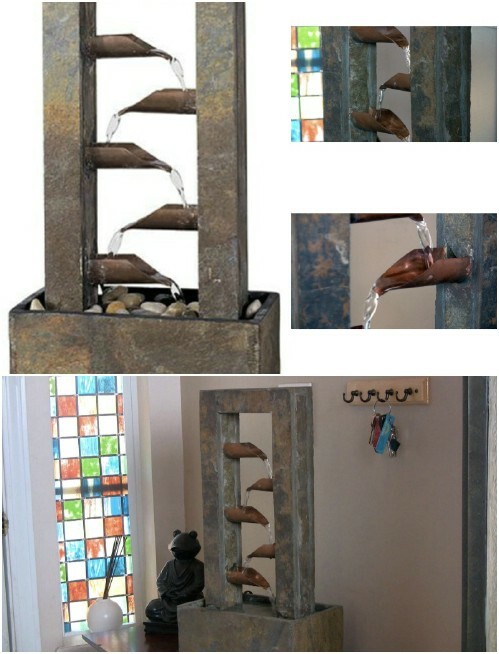 This rustic waterfall is so innovative and beautiful! 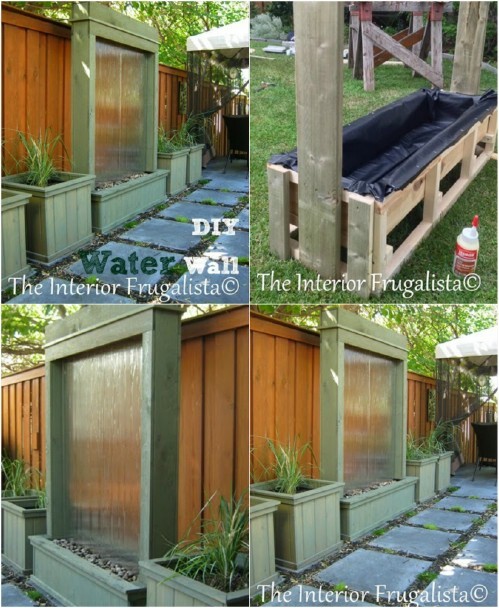 I love how the wooden box hides the plastic container, and the fact that you can build that yourself and design it as you wish. The makeshift shower head is the real showstopper here, it’s what really makes this piece so eye-catching. I really like the use of bamboo in this water feature – it gives it that little something different and it looks so elegant! This is a real cinch to make and get running, so this quick project is perfect for absolutely anyone. This is such a wonderfully creative and playful project! 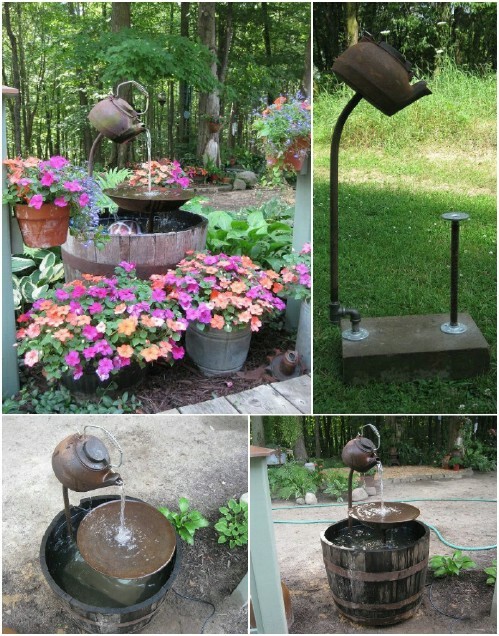 The fun use of watering cans really is the ideal fountain to set in your garden amongst your plant life. 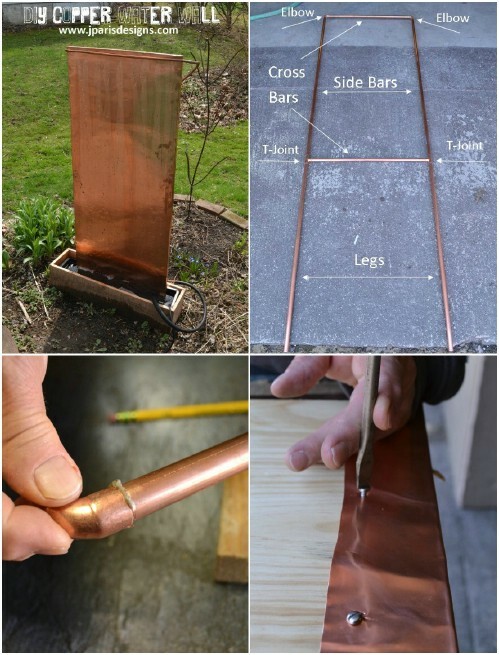 Not only is this project really simple to put together, but it’s also really easy on the wallet, which is always a plus! 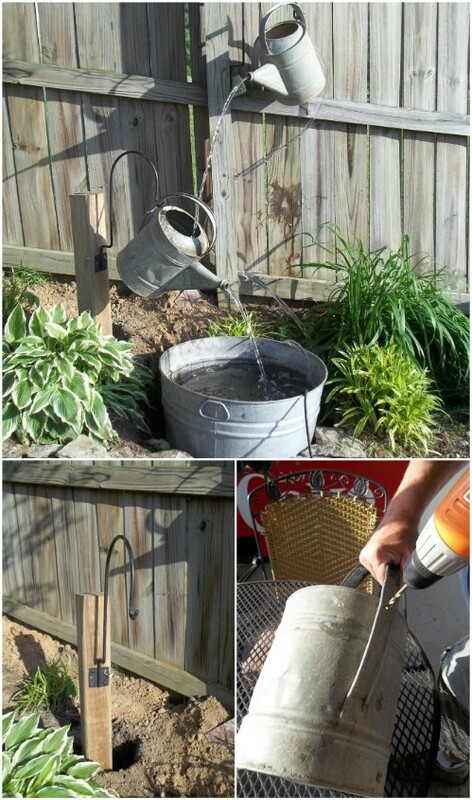 Here’s another genius creative way to include a watering can in a DIY fountain project. 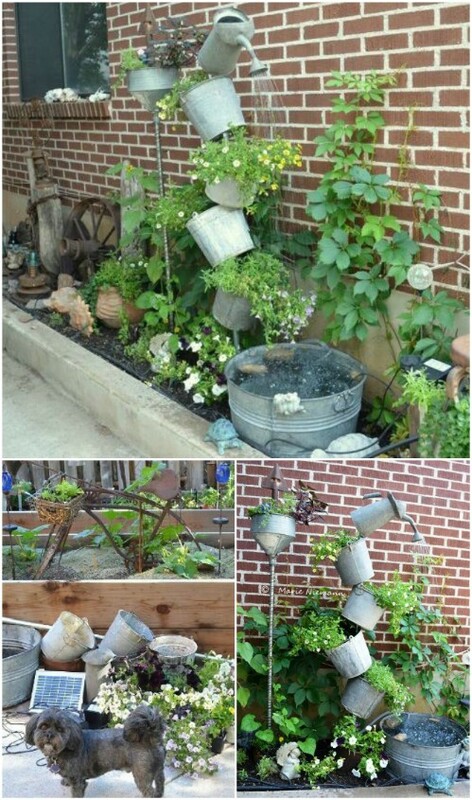 The tipsy tiered planter is something we’ve seen many times before, but I’ve never seen it done with galvanized buckets, with a fountain twist, and with a solar powered pump system. Absolute brilliance! If you want something calming and decorative your deck or porch that is easy to make from cheap materials, then you’re in luck! You should be able to find the egg at your local nursery, and the remaining items (bowl and fountain parts) should be easy to pick up. I love this feature because it’s looks simplistic and elegant without a visible reservoir. 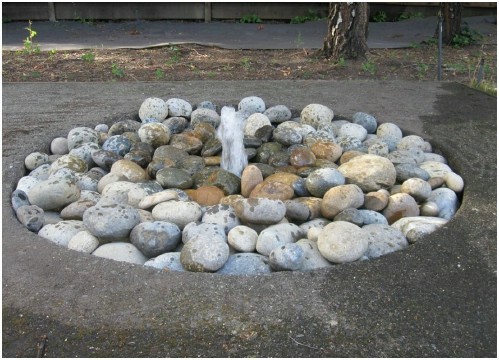 The decorative stones really make this feature the natural stunner that it is – I think a combination different types and colors would work wonderfully. 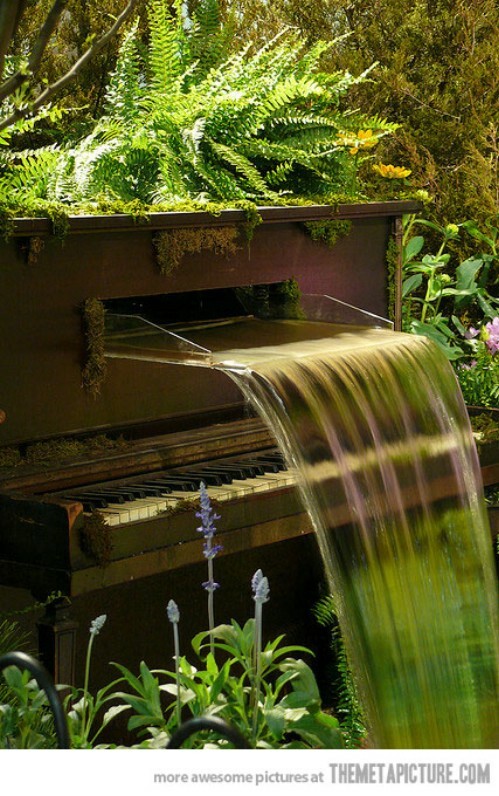 Ok so there’s no tutorial for this piano fountain but I just had to include the image because it’s just so incredibly beautiful! A bit of eye candy for inspiration is never a bad thing. Doesn’t it look like it belongs in some magical, musical fairy tale? 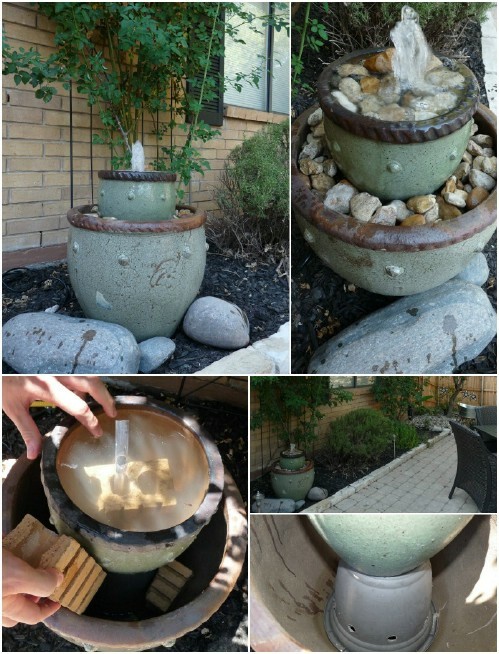 in one of the pics it shows a wine glass/bottle water feature…..where do you those instructions posted? Oh my goodness! All of these ideas are just stunning! I love water features. I feel like they add such a nice touch to gardens, and they’re pretty easy to make. 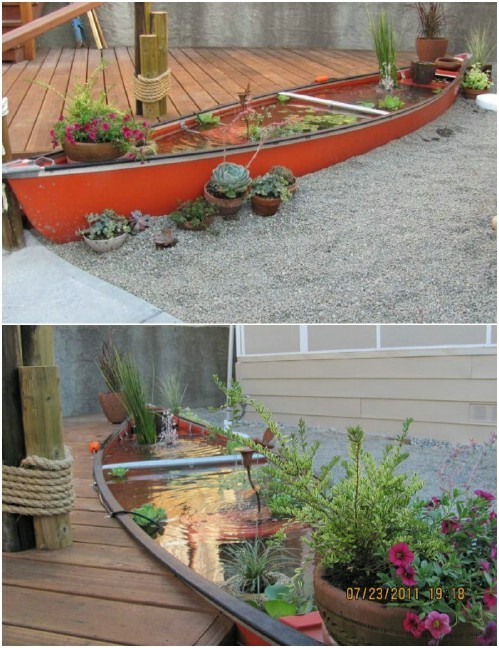 I absolutely adore the idea of using an old canoe to make a little pond. I might have to try that in my garden. My husband loves canoeing and we have so many old ones that we don’t use anymore. Thanks for the idea!